When you started building your family tree, you may have known only your 4 grandparents' names. What fun it is each time you discover a relative's parents' names. You've added another generation to your tree! Here are 6 places to look for the names of that previous generation. Some may surprise you. Look closely at each member of your relative's household in each census. You may find the Head of Household's mother, father, mother-in-law, or father-in-law living with the family. The best find is the male head of household's father-in-law. Now you've got the wife's maiden name! If your male relative was single and the right age, his draft registered card may name his father or mother as his nearest relative. 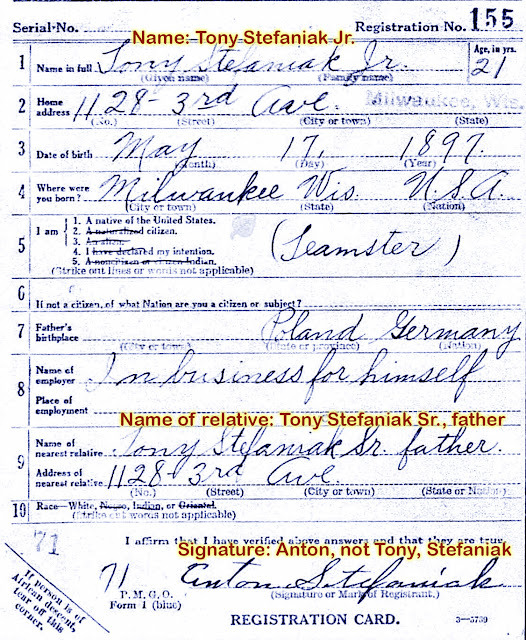 In this example, Tony Jr. is not his real name—it's Anton Jr. But this card is evidence that he is, in fact, named after his father. The draft registration card for a single man may give you his mother or father's name. I'd heard stories about "Uncle Anton" from my mother-in-law. When I found this card, I realized his father's name was Anton, too. If your ancestor emigrated during a particular span of years, you're lucky. Their ship manifest may include a column labelled, "The name and complete address of nearest relative or friend in country whence alien came." Your relative may give the name of their spouse. But an unmarried traveler may name their father or mother. 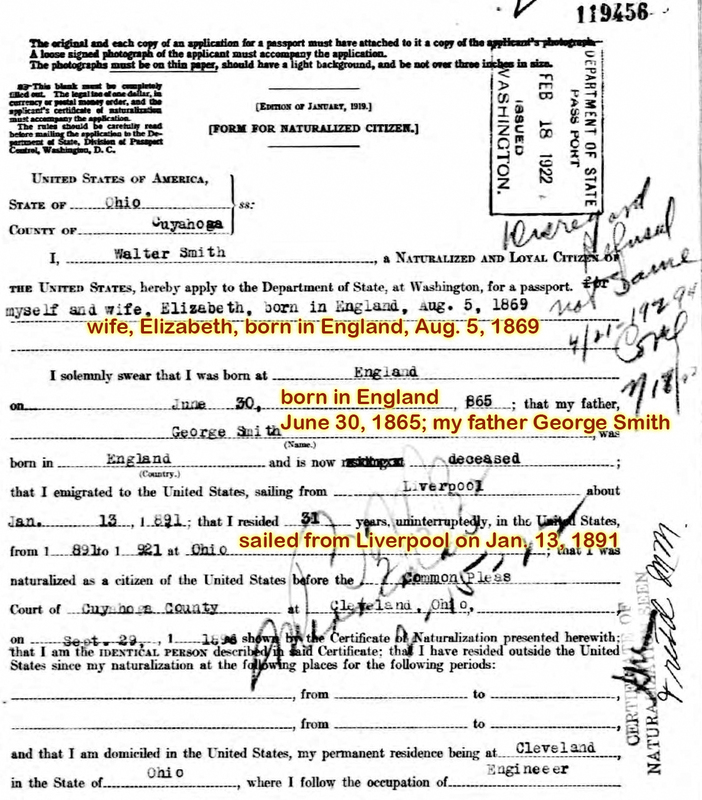 Your immigrant ancestor's ship manifest can tell you their hometown—and their parent's name. You may not understand this scribble, but this is my grandfather Adamo naming his father Giovanni as the relative he's leaving in his town of Baselice. A while ago I found a collection on Ancestry.com called "U.S., Social Security Applications and Claims Index, 1935-2007". If your relative worked in the United States after the 1935 founding of the Social Security Administration, they should have Social Security records. Hopefully you're already familiar with the SSDI—the Social Security Death Index. That can give you dates and places of birth and death. But the Applications and Claims Index can give you much more! With some luck, you can learn the decedent's father's name and their mother's maiden name. Plus, if you're looking up a female relative by her birth date, you can learn her married name. If your relative was a U.S. citizen going to another country at a certain time, they needed a passport. These applications can be a treasure trove. And you even get a photo. If the applicant is a married woman, you'll get details about her husband rather than her father. A passport application provides lots of names, dates and places you need. This example is from a relative named Walter Smith. It provides birth dates and countries for Walter, his wife Elizabeth, and his father George. It also says when he sailed from Liverpool to the U.S., and on which ship. The next page has photos of Walter and Elizabeth. That's some valuable info when you're researching a guy named Smith! The parents' names on a birth record should be pretty reliable. But either parent may be using a nickname rather than their true, full name. All information on a death record is obviously supplied by someone other than the person who died. What if the decedent is an 85-year-old who was born in another country? Will their child, who's supplying the information, know the correct spelling of their grandparents' names? What if they never even met those grandparents? If the couple getting married is pretty young, you can have more confidence in how they list their parents' names. (The "nickname" rule still applies.) But if the couple is older—2 widows getting remarried—the information is more likely to have an error. If your couple got married in the same little town where they were born and raised, the clerk writing the names is more likely to get them right. The lesson to take away is this: Don't give up on that previous generation if you can't get your relative's vital records. You have 5 other types of records to find, each of which can help you fortify your family tree. When my in-law's father died, she knew nothing about his family but his parents' and his sister's names. I offered to build her family tree. With only a few names and the states where they lived, I was able to add several generations to her tree. It wasn't hard because they'd lived in America for so many generations. Census records offered a way to trace the family's moves from state to state. But only a few groups of people have lived on the same continent since before recorded history. At some point, everyone else immigrated. To trace your family back to another country, you must find out exactly where they came from. Once you find that town name, you'll know where to search for birth, marriage and death records. Here are 4 of the best places to find your ancestor's hometown. The later your ancestor came to your country, the better. Before the 1890s your ancestor's ship manifest may tell you only their home country. A later immigration record can give you that important hometown. While researching my great grandmother Maria Rosa Caruso, a cousin said Maria Rosa mentioned her Italian hometown often. She called it "Pisqualamazza". seen on her immigration record. Unfortunately, there is no such town. My research was at a standstill. So I searched for anyone named Caruso coming to New York from a town that sounded like "Pisqualamazza". And I found it. My great grandmother's 1906 ship manifest shows it, and the transcription on Ancestry.com helped me read it. My great grandmother's Pisqualamazza was Pescolamazza! When I found no such town on a map, I Googled it. 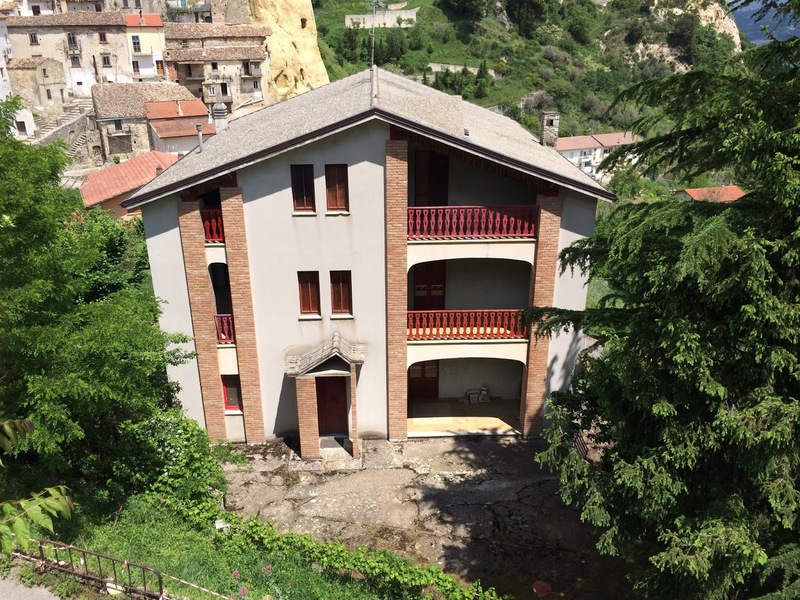 Pescolamazza changed its name to Pesco Sannita in 1948, so my great grandmother knew it by its old name. My great aunt told me our Saviano family was from Avellino, but that's not specific enough. Avellino is both a city and a province with many towns. I was stuck. It was my 2nd great uncle's World War II draft registration card that changed everything. He was 64 years old in 1942, but he still had to register. Thank goodness. Because, despite 2 spelling errors, I learned he was born in Tufo, Avellino. I looked at an online map to find the correct spelling. This 1942 draft registration card gave me the exact location I needed. Shortly after that discovery, I found his 1877 Tufo birth record, and that of his older brother none of my cousins had ever heard of. 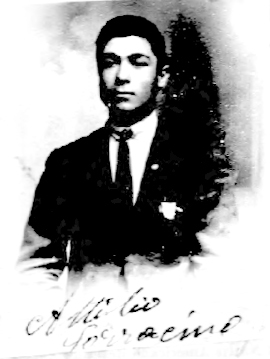 My grandfather came to America in 1920 at the age of 18. He first went to live in Newton, Massachusetts, where his uncle lived. Then he went to work in Western Pennsylvania where he applied to become a U.S. citizen. His "declaration of intention" papers include his hometown of Colle Sannita, Italy, and his birth date—which is not what we thought it was. 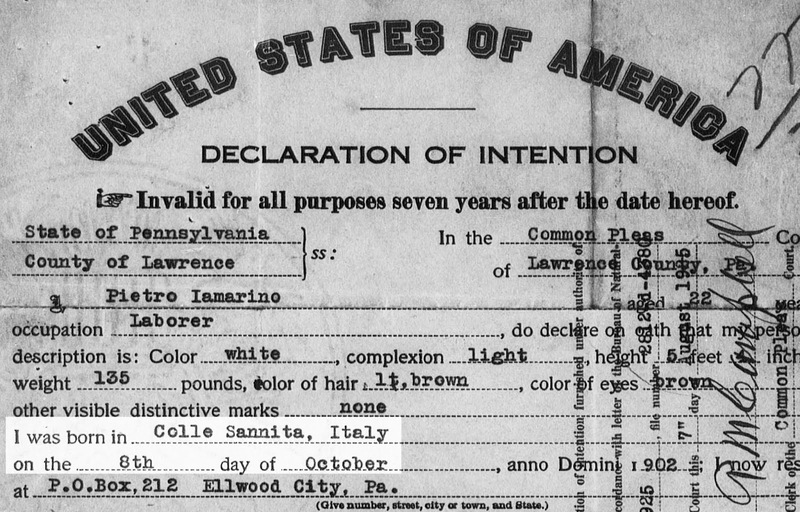 Knowing his hometown, I was able to get his 1902 birth record from the Italian archives. This confirmed that he was born on October 8, just like it says on his declaration of intention. Naturalization papers can provide birth dates and places—sometimes for an entire family. It's always a thrill when you can find your ancestor's passport application, complete with a photo. My cousin Attilio Sarracino's passport application confirmed that he was born in New York. But his father, Carmine, lived in Pastene, Italy. There may be typos, but a passport application provides solid information you need. Members of this family went back and forth between Italy and America a couple of times. 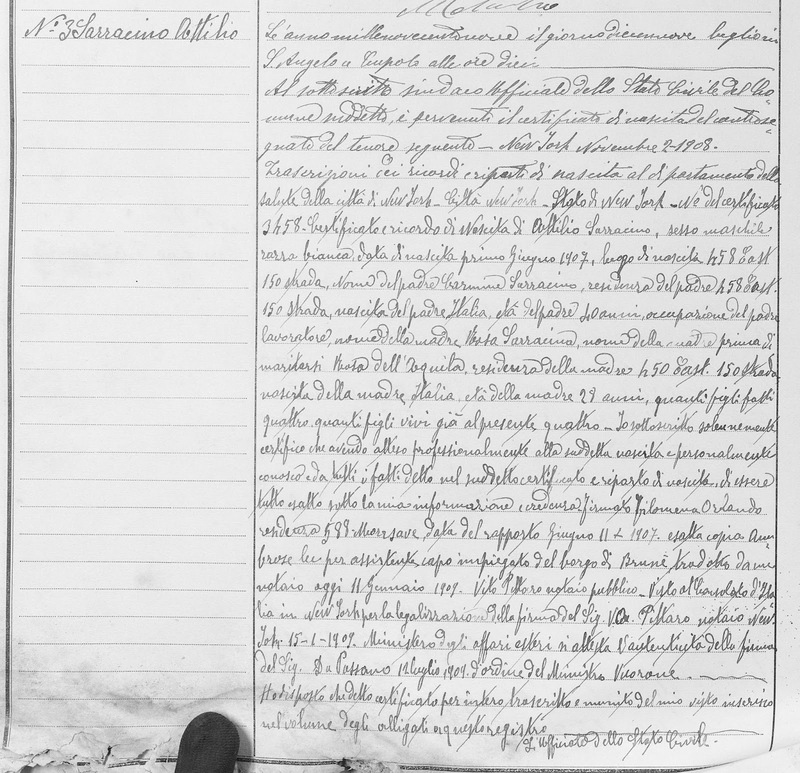 I found a record of Attilio's 1907 U.S. birth in Pastene, Italy's 1909 register book. They needed him on the record books because his family was planning to stay in Italy and raise him. Finding these documents helped me make sense of family lore. "Pisqualamazza" wasn't a place. "Avellino" was too vague. And there are 2 towns (Pastene and Pastena) with families named Sarracino! Before you dive into a new collection of foreign vital records, find all the domestic records. Make sure you know your ancestor's hometown so you don't end up chasing documents that aren't there. What If Your Ancestor Isn't Where You Expected at All? My great aunt Stella and her husband Attilio had the same last name—Sarracino. Stella told me they had permission to marry because they were absolutely not related. That wasn't quite true. They weren't closely related, so it was OK for them to marry. But they were indeed cousins. 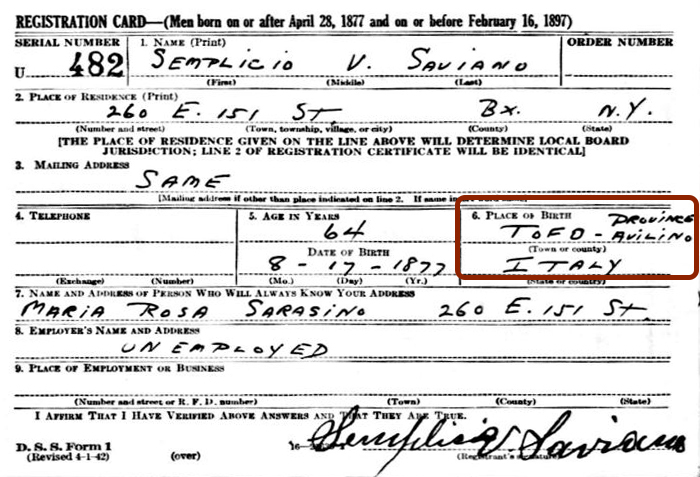 Attilio Sarracino's 1907 U.S. birth was recorded in Italy in 1909. I discovered this when I traced Attilio's parents to the same little hamlet in Italy where my great aunt's parents were born. It's the frazione of Pastene in the comune of Sant'Angelo a Cupolo. I'd already collected the Pastene birth records for Stella Sarracino's parents—my great grandparents. (See How to Use the Online Italian Genealogy Archives.) Then I found the Pastene birth records for Attilio's parents, Carmine and Maria Rosa dell'Aquila. Carmine came to New York City in 1891 at the age of 25. He returned to Pastene and married Maria Rosa in 1898. They had a son Equilino in 1899. He was born while Carmine was spending another year in New York City. He returned to Pastene and had a son Carlo in 1902, and a daughter Stellina in 1903. In 1904, baby Carlo had died, but the rest of the family came to New York City in April. In 1905 their son Enrico was born in the Bronx. In 1907 their son Attilio was born in the Bronx. Between Attilio's June 1907 birth and October 1909, Carmine and Maria Rosa returned to Pastene. Let me stop right there. In my extended family, it's rare to see a family come to America for a while, and then return to Italy. When my genealogy research showed me that Carmine and Maria Rosa continued having children in Italy after Enrico and Attilio were born in the Bronx, I thought they had abandoned their boys. I thought they must have left them with relatives. In October 1909, daughter Iolanda was born in Pastene. In 1911 Carmine made another trip to New York City. In June 1911 his daughter Antonia was born in Pastene while Carmine was in New York City. In 1916 Carmine was back in Pastene and his son Guido was born. I know that Enrico, born in the Bronx, died in the Bronx at age 80. His brother Attilio, born in the Bronx, died there, tragically, at age 33. Were they ever reunited with their parents? Or did they only see their father on his occasional trips to America? The answer was hiding in my downloaded collection of Pastene vital records. While going through the 1909 birth records for Pastene, I found two records detailing the U.S. births of Enrico in 1905 and Attilio in 1907. These late entries for their births may have been required by the comune of Sant'Angelo to have a record of their inhabitants. These late birth records are so detailed, they include the address of the house where the boys were born—458 East 150th Street. The records include the names and Bronx addresses of the witnesses to the births. I know from Attilio's passport records that he returned to New York City in 1924. (See Your Family Tree Needs Your Ancestor's Passport Application.) I also know Enrico was in the Bronx in 1924. He testified that he recognized his brother's passport photo. He hadn't seen his brother since they were together in Italy two years earlier. Finally this family mystery makes sense. Young Enrico and Attilio were not left behind. They did return to Italy with their parents and siblings. They each lived in Pastene until, like most young men at the time, they were old enough to make their own way in America. I'm still piecing together facts from my downloaded vital records to discover the exact relationship between my great aunt Stella Sarracino and her dashing young husband, Attilio. Did your immigrant ancestor travel back to the old country to visit his family? You may be able to find his U.S. passport application—complete with passport photo. 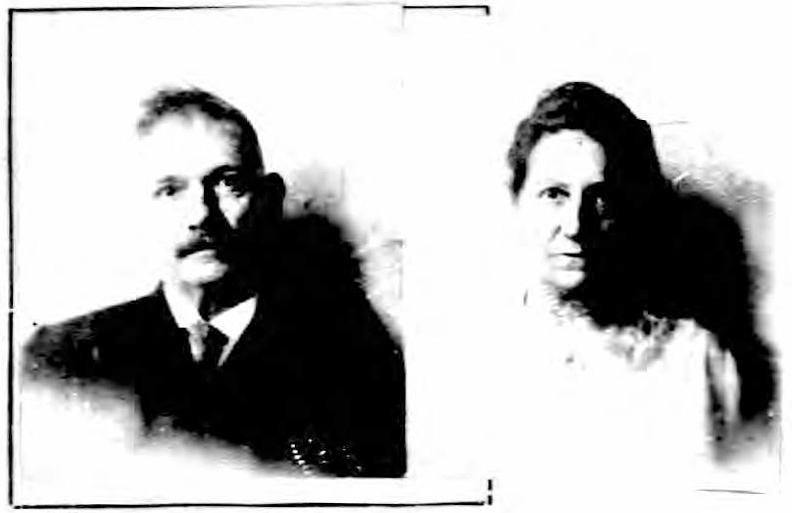 The Robison family of Westchester County, New York, planned to visit England, France, Italy, Egypt and Palestine in 1924. Their passport photo includes the entire family. The application provides everyone's name, date of birth and birthplace. Plus it includes Mr. Robison's father's name and place of birth, and his wife's maiden name. A single passport application provided important genealogy facts for eight people. This single document provides key facts for eight people! That is a fantastic find for any genealogist. Mr. and Mrs. Walter Smith traveled to the British Isles in 1922 to visit family, and apparently to help me find the needle in the Smith haystack. With their passport application information, I was able to find the right Smith family for my family tree. Faces to go along with the names! U.S. government-issued passports date back to 1789. Passports were required for foreign travel during the Civil War and World War I. The rules eased for a while, but the requirement became permanent once World War II began. If your ancestor went back to the old country to visit his parents, he might not be allowed back into the United States without a passport. The National Archives in Washington, DC, holds passport applications from 1795–1925. They are available to some extent on ancestry.com and elsewhere. Date and place of immigration to the U.S.
Years of residence in the U.S. Whichever resource you use, first check the description of the collection to see if it may include your ancestor. Hopefully you'll find a thorough application with a photograph. That is certainly worth your ancestor's ticket price.